The U.S. High School Bowling Foundation will be hosting the 2017 U.S. High School Bowling National ChampionshipTM in Smyrna, Tennessee on June 24-25, 2017.. This will be the second national championship post-season event showcasing the best boys and girls high school bowlers from across the country... and to promote the importance and growth of high school bowling across the United States! The 2017 U.S. High School Bowling National ChampionshipTM is a two-day competition featuring both "Singles" and "Team" events in both Boys and Girls divisions.. Day 1, all high school teams will be competing in the "Team" event in their respective divisions... Day 2, all bowlers will be competing in the "Singles" event, also in their respective divisions.. This competition is a USBC Certified tournament.. See below for more details. The format of "Team" event and "Singles" event will each consist of a qualifying round, leading into the "Survivor" elimination rounds.. The "Survivor" elimination format was specifically designed to provide maximum opportunity for more bowlers to advance further during each day's competition. 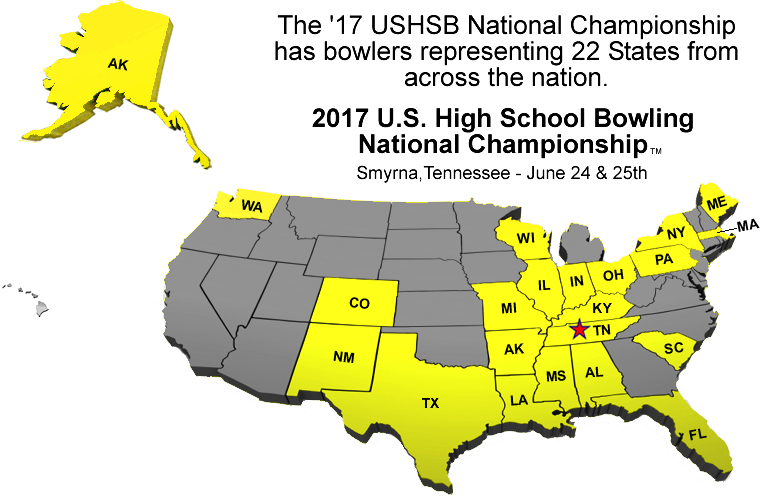 The USHSBF congratulates all of the bowlers who will be representing their respective States and High Schools during the 2017 U.S. High School Bowling National ChampionshipTM.. Winners will each earn national championship RINGS!...Any bowler winning both the "Singles" and "Team" events, will have the option to receive a specially designed one-of-a-kind ring showcasing the achievment of winning both championships in a single year! DUAL QUALIFYING ROUND: All bowlers play three (3) regular games each of team bowling and three (3) BAKER games with their team, moving to a new pair of lanes after each game. The top 20 boys team and 16 girls teams with the highest eighteen games (15 regular & 3 Baker) of total pinfall in each division will advance to BAKER Survivor Round 1. . TIES - In the event of a tie for the final Survivor advancer, the teams with the tie will roll a one-game BAKER roll-off will take place to determine the Survivor Round 1 team qualifier. This will be the tie-breaker format for all team Survivor Rounds. .
Total pinfall for each team will carry over into the next round. BAKER SURVIVOR ROUND 1: All 20 boys team / 16 girls teams will play three (3) additional BAKER games.. All three (3) BAKER games will be played on a new lane after each game. The top 10 boys / 8 girls teams with the highest twenty one games of total pinfall in each division will advance to "Elite Eight" BAKER Survivor Round 2. . In the event of a tie for the 8th place team total, a one-game BAKER roll-off will take place to determine the 8th place team qualifier.. Total pinfall for each team will carry over into the next round. BAKER SURVIVOR ROUND 2: All top-10 boys teams and top-8 girls teams will play three (3) additional BAKER games.. All three (3) BAKER games will be played on a new lane after each game. The top four (4) boys and girls teams with the highest total pinfall advance to the "Final Four" Baker Survivor Round 3. The teams with the second, third and fourth highest totals in each division will advance to the "Final Four" Survivor Round.. ALL PINFALL IS DROPPED FOR THE FINAL FOUR. "FINAL FOUR" BAKER SURVIVOR ROUND 3:. The team with the highest total pinfall entering the "Final Four" will receive a bye into the Championship Match.. Teams with the 2nd, 3rd, and 4th highest total pinfall will play three (3) BAKER games on a new pair of lanes.. All three (3) BAKER games will be played on a new lane after each game. The team with the highest BAKER 3-game total of the three teams in the "Final Four" Survivor Round 4 will advance to the "Championship" Survivor Round 5.. ALL PINFALL IS DROPPED FOR THE CHAMPIONSHIP MATCH. "CHAMPIONSHIP" BAKER SURVIVOR MATCH 4: All teams in the top-2 will play three (3) BAKER games on a new pair of lanes.. The highest qualifying team will have the choice of which lane they want to bowl the third game.. 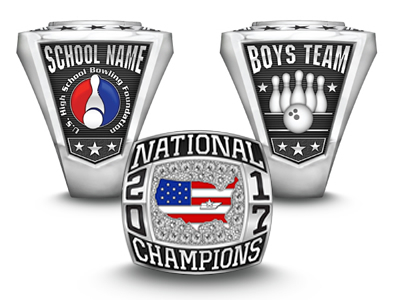 The highest Boys Team 3-game BAKER total and highest Girls Team 3-game BAKER total will be declared the winner of their respective divisions.. Each bowler on the winning "Boys Team" and winning "Girls Team" of the 2016 U.S. High School Bowling National ChampionshipTM also win National Championship "Team" RINGS. QUALIFYING ROUND: All bowlers play 4 games of regular bowling, moving lanes after each game. The top 150 boys and 110 girls with the highest four-game total pinfall will advance to Survivor Round 1..
Total pinfall for each bowler will carry over into the next round. SURVIVOR ROUND 1: All 150 boys / 110 girls will play 1 additional game of regular bowling.. 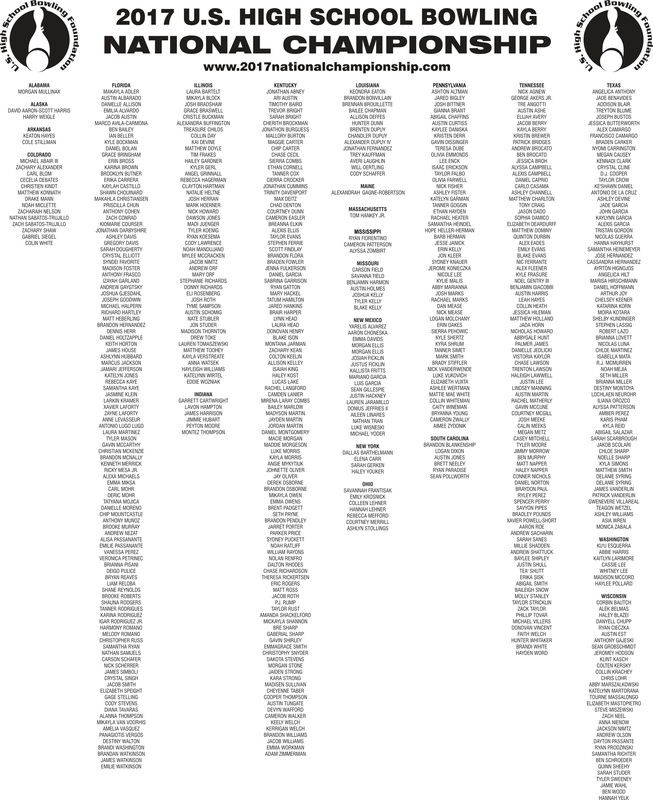 The top 75 boys / 55 girls with the highest five-games of total pinfall will advance to Survivor Round 2.. SURVIVOR ROUND 2: All 75 boys / 55 girls will play 1 additional game of regular bowling. The top 32 boys / 28 girls with the highest six-games of total pinfal will advance to Survivor Round 3.. SURVIVOR ROUND 3: All 32 boys / 28 girls will play 1 additional game of regular bowling. The top 16 boys / 14 girls with the highest seven-games of total pinfall will advance to Survivor Round 4..
Total pinfall for each bowler will carry over into the next round.. SURVIVOR ROUND 4: All 16 boys / 14 girls will play 1 additional game of regular bowling. The top 8 bowlers with the highest eight-games of total pinfall in each division will advance to "Elite Eight" Survivor Round 5.. Total pinfall for each bowler will carry over into the next round. "ELITE EIGHT" SURVIVOR ROUND 5: All bowlers in the Elite Eight (8) will play 1 game of regular bowling.. The top 4 bowlers with the highest nine-games of total pinfall in each division will advance to "Final Four " Survivor Round 6.. The bowler with the highest total pinfall after the Elite Eight Survivor Round 5 will be automatically seeded in the Championship Survivor Match and will receive a bye in the "Final Four" Survivor Round and is automatically seeded in the Championship title round!. ALL PINFALL IS DROPPED FOR THE 'FINAL FOUR' ROUND. "FINAL FOUR" SURVIVOR ROUND 6: Three bowlers (2nd, 3rd, and 4th highest total pinfall) will play 1 game of regular bowling.. The top single-game score of the three bowlers of the "Final Four" Survivor Round 6 will advance to the "Championship" Survivor Round 7.. ALL PINFALL IS DROPPED FOR THE CHAMPIONSHIP ROUND. game in each division will be declared the winner of their respective divisions.. 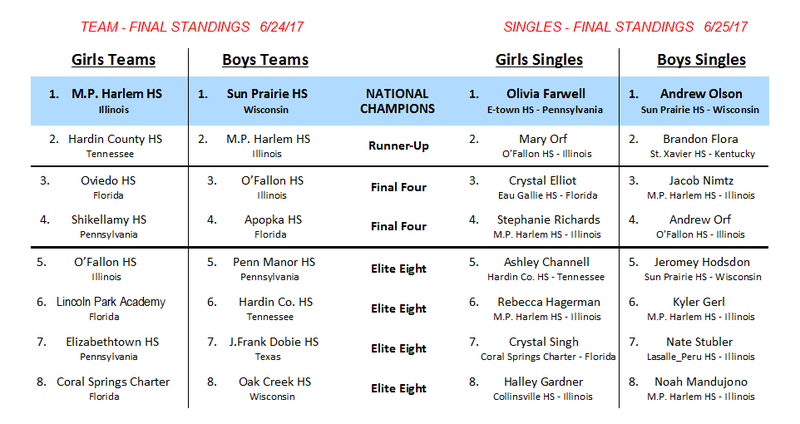 The individual boys and girls winners will be the 2017 Boys "Singles" U.S. High School Bowling National ChampionTM and 2017 Girls "Singles" U.S. High School Bowling National ChampionTM.. Both "Singles" National Champions also win National Championship "Singles" RINGS. ELIGIBILITY #1:..Must have qualified in the most recent high school bowling State Championship, State Finals, etc. or its equivalent.. All State high school bowling programs are eligible to compete in the 2017 U.S. High School Bowling National ChampionshipTM.. School teams must be made up only those who were listed on the submitted school team roster submitted to their respective State high school bowling tournament organization. .This INCLUDES graduating/graduated Seniors, as they were a part of this current 2016/17 State Championships, Finals, etc. .See tiered entry timeline below for availability. ELIGIBILITY #2:..Any bowler or team that set a new State or National RECORD during the current season automatically earns eligibility to enter the 2017 U.S. High School Bowling National ChampionshipTM tournament, regardless of whether they do or do not qualify for their most recent State Championship, State Finals, etc. or its equivalent. TEAMS - The four (4) highest ranked teams that did not qualify for their respective State Finals are eligible to enter the 2017 U.S. High School Bowling National ChampionshipTM tournament. .Maximum of four (4) boys and girls TEAM Wild Card entries per State. SINGLES - The four (4) highest ranked individuals that did not qualify for their respective State Finals are eligible to enter the 2017 U.S. High School Bowling National ChampionshipTM tournament. .Maximum of four (4) boys and girls SINGLES Wild Card entries per State. "RANKING" is determined by each State. If no State ranking is avaible, then the highest non-State qualifying teams and individuals from last event prior to the State Finals. Wild Cards entries are available on a first-come, first-served basis. WILD CARD entries must provide their final standings in their respective Regional, Sectional, District, etc. that immediately preceed their State Finals in order to be Wild Card eligible. *DISQUALIFICATION:. ANY Singles entry and/or school team found to have one or more bowlers competing in the 2017 U.S. High School Bowling National ChampionshipTM that did not participate is their most recent high school bowling State Championship, Finals, etc., OR is an approved WILD CARD entry, will be DISQUALIFIED from the competition and will forfeit their entry fee, standing in the tournament, and any prizes they may have received. ENTRY FEE:..$300 - TEAM (Saturday, June 24th)..
...................... $60 - SINGLES (Sunday, June 25th). ANY team that qualified for this season's State Championship, or equivalent, is eligible to participate in the 2017 U.S. High School Bowling National ChampionshipTM "Team" event. Teams will consist of schools with a roster of at least five (5) and no more than eight (8) bowlers. Traditionally, boys only and a girls only teams. However, a boys team may include girls (aka, unified team) provided that is how that school team participated during their respective State Championships. No additions to a school teams roster from how they registered and participated in their respective State Championship is permitted during the 2017 U.S. High School Bowling National ChampionshipTM. *See DISQUALIFICATION regarding violations of this rule. There is no minimum number of bowlers on a school team's roster. However, a score of zero (0) will be scored in any frame for absent or missing bowlers during any BAKER Game. Five (5) bowlers entered in the Girls "Team" Event are automatically eligible and entered into Sunday's "Singles" Event. (Boys Singles is FULL) Participation and/or completion of the "Singles" event is not required, though it is encouraged.. For Girlst Teams, five (5) singles entries are paid with the Team Entry Fee. ..NOTE: As of 5/11/17, only Girls Team entries include five (5) paid Singles entries... the Boys Singles event is FULL. ROSTER - Team rosters will consist of five (5) starting bowlers and have the option of having up to three reserve players; with a maximum of eight bowlers per school team.. A team will have no more than five (5) active bowlers playing during the team event at any given time. RESERVE PLAYERS - Each team is allowed to have a maximum of three reserve bowlers on their roster.. TEAM UNIFORMS: ALL bowlers are required to wear matching school/team uniforms during all competition events during the 2017 U.S. High School Bowling National ChampionshipTM. No hats, t-shirts, tank tops, shorts, cutoffs, jeans are permitted during competition of the 2017 U.S. High School Bowling National ChampionshipTM. All bowlers will bowl scratch. All other USBC rules will apply. ANY bowler that qualified as a "Singles" entry in this season's State Championship, or equivalent, is eligible to participate in the "Singles" Event ONLY of the 2017 U.S. High School Bowling National ChampionshipTM. Any individual that qualified with their school team in this season's State Championship, or equivalent, is eligible to participate in the "Singles" Event ONLY if that individual's team was unable to participate as a school team during the 2017 U.S. High School Bowling National ChampionshipTM. Any individual bowler that equals or establishes a new State or National scoring record will earn eligibility status into the the "Singles" Event ONLY of the 2017 U.S. High School Bowling National ChampionshipTM. No additions to a school's team or individual roster from how they registered and participated in their respective 2016-17 State Championship is permitted in the "Singles" event. SINGLES UNIFORM: ALL bowlers are required to wear his or her school 'colors' during the "Singles" Event of the 2017 U.S. High School Bowling National ChampionshipTM. All future U.S. High School Bowling National Championship competitions will only be scheduled during the summertime; between the calendar dates of June 1st and July 31st, so to not interfere with class time during the regular academic season. Consistence with the principle of a culminating event, the U.S. High School Bowling Foundation will only schedule one (1) U.S. High School Bowling National ChampionshipTM per year/season. The NFHS can neither grant nor refuse permission for any high school to attend any event. That function is not within the organization’s jurisdiction. Inquiries regarding permissibility should be directed to the schools themselves, and to their respective state high school associations. The NFHS is not affiliated in any way with the 2017 U.S. High School Bowling National Championship, nor does it sanction or support this competition in any way.